As someone who meditates daily, I keep a meditation/dream journal beside my bed. I never realized how important this was until the summer of 2010 when something remarkable began to happen. Specific recurring images filled my meditations—visions of hills, valleys, mountains, and forests…but they were not the usual kind you find in nature. No, each of these were made of calico fabric. In the book I weave them into the story through the main character, Carrie, whose dreams are actually taken from my meditation journal. I had another meditation of rolling hills of fabric. It all began with those familiar lights flickering on sparkling water. Next, I was looking down at the patterned lands that were made of patches of varying colors. I felt as if I were flying as I soared overhead. The hills had valleys and I dipped down into them. I looked all around at the many colors of blue, pink, green, lavender, and gold. Then a black, misty fog covered the hills and all went dark. The darkness slowly became un-foggy as if the sun was beginning to rise. Black hills appeared and three horses were standing on the ridge. They were pawing the ground and I heard them snorting as they swished their tails. They were real horses but they were covered in patches of fabric. As I looked closely I could see that they were each made of the same patterns I had seen on the hills. Three beautiful horses covered in calico fabric. And then the meditation ended. Months went by and I kept seeing, hearing, and feeling wild horses in my meditations, I decided to take action. It was as if I was becoming a detective— why had calico covered the land and the horses? What was the meaning of my daily meditations? It was during this research that I learned about the plight of the wild horses named after the colorful Calico Mountains located in Nevada. Bingo! 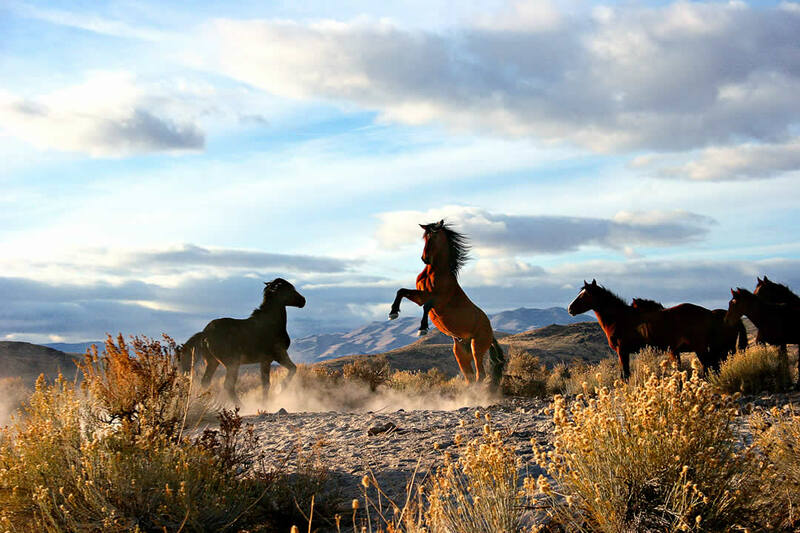 I discovered that in the infamous “Calico roundup” from December 28, 2009 to February 4, 2010, over 1700 horses were taken from their range in the Calico Mountain Complex in Northwestern Nevada’s Black Rock Conservation area. Over 140 wild horses died as a result of this roundup. Could these be the horses who were calling out to me? I believed they were and decided to record their story and share their message. Following the guidance of the wild mustangs, I was led to Caroll Abel, an equine photographer and wild horse advocate. Her photographs were connected to the visions I had seen, and without hesitation I knew she was key to helping me tell the story. It was through her wisdom, keen eye, and love for all animals, that I was able to convey the message spoken from the heart. The horses that survived are now in a safe sanctuary and you can learn more about them here. Carrie’s mom decides to uproot her from their familiar Jersey Shore home and move to the dusty deserts of Nevada. The move is as prickly to Carrie as the cactus beside her new home. But something mysterious greets her when she closes her eyes each night—like a winding path, her dreams guide her to the horses of the Calico Mountains. How can a few children make a difference to the plight of the foals snatched from their homes without warning? Like the tiny patches of cloth that adorn a calico quilt the clues draw them all together. Follow the Calico Horses as they lead us down the trail of adversity to the peaceful pastures found by helping one another. Twirl Toy Store & Play Space. “We were amazed and thrilled to see so many people join together with such enthusiasm and excitement to take part in Lorraine Turner’s Equine Watercolor Workshop at Bower’s Mansion in Reno, Nevada. The 15 adults and children in attendance, some as young as 8 years of age, were mesmerized and very keen about following Lorraine’s simple but very sophisticated process of creating their personal work of art. Hidden Valley Wild Horse Protection Fund would be very proud to sponsor another one of Lorraine’s art workshops. “The wild horses on the Outer Banks of North Carolina have survived five centuries of hurricanes and fierce nor’easters. They are strong and determined like the characters in this book. They will persevere against all odds. In this lovely tale, “Calico Horses and the Patchwork Trail” the author teaches us about the very real ordeal America’s wild horses daily face in order to survive. In language targeting pre-teens but with lessons that will resonate with all of us, the book describes the capture and removal of the horses from the range and a young girls struggle to understand and help them-as she tries to understand the changes taking place in her own life as a result of her parents break up and divorce. As we learn about the BLM’s sometimes brutal handling of the wild horse population and the reactions of the people fighting to help them, we learn that meditation, perseverance and love can make a difference. With honesty, compassion and a little magical realism along the way, the author gently teaches us some of life’s lessons as we gain some insight about America’s wild horses. This is a book about struggle, survival and succeeding. Author Lorraine Turner has worked hard to bring to light the management and associated issues of the wild horses and burros that are rounded up by the BLM in the area and then adopted out to appropriate owners. Mix these issues with some passionate 10 year old girls going through the growing pains of life and messy choices made by their parents, and you have a really interesting make up for a thought provoking story. The overall message about children being advocates for treating horses (and other animals) respectfully is one that should be driven home by all. An entertaining read. Calico Horses and the Patchwork Trail was a wonderful story about the real-life issues our children are facing each day; divorce, moving away from friends and family, dealing with parents, bullying and caring for animals. The book weaves together the beautiful message of our responsibility to one another, the land and all creatures. Another element of this story is the natural ability of the young characters to tap into their inner strengths. The children use meditation to problem solve and set themselves on a mission to save the wild horse. Throughout the story a mystery evolves that eventually links all the characters together and ends with a message of love and concern for the wild horse of the great American west. The plight of the wild horse in American is a real tragedy in our country today and one that deserves our collective attention and intervention. The author has gone as far as providing the reader with resources for further investigation into the story of the wild horse. Calico Horses and the Patchwork Trail is an exploration of the decisions made by adults, how they affect children (both human and horse), and how the children are powerless to deal with those decisions. This is a great book about the coming of age of some typical “horse crazy girls” set against the backdrop of the real life struggle of wild horses. The book uses the allegory of a pre teen girl uprooted from her home and family through a divorce and how she finds her calling by learning about and caring for wild mustangs that have also been uprooted from their homes by government round ups. The wild horse issue is introduced in a thoughtful and even handed way, giving equal credence to both the BLM viewpoint as well as the viewpoints of wild horse advocates. The story, set mostly in Nevada in the shadow of the Calico mountains, adds credibility to the story as this is the location of real life round ups over the last 4 years. The spiritual thread in the story also adds an interesting element that is not usually present in books designed for this age group. Calico Horses and the Patchwork Trail by Lorraine Turner is a coming of age tale about the interaction between a group of ten year old girls, their families and the natural kinship of human and animal. A very balanced look at the struggle of the wild mustangs of the Calico Mountains is presented. Through learning about the horses the girls learn about themselves and their shared journey. There is a definite spiritual thread that runs throughout the work. The girl’s dreams, personal meditations, visions, art, and even the connection to the spirit of a beloved Grandmother and other ancestors are used by the girls to find their path and discover their connectedness. The girls learn to overcome divorce, death, bullying, and disappointment, while seeking out purpose and community. The girls come to understand that everyone and everything is inextricably linked, that We Are One. Lorraine Turner is an artist living in the Florida Keys. Her own dreams and meditations are depicted in the book, in fact, a vision of the Calico Mountains and the plight of the wild horses that live there was the inspiration for the writing of the book. The method of meditation Turner practices herself, Sae-sii Meditation, is outlined in the book and is used by the characters as a way to relax, solve problems and connect to Spirit. Turner provides a way for young readers to experience the message that she received in her meditations, to come to the understanding that we must work in balance with nature of which we are a part. I am an avid reader and I was unable to put this down. Connecting hurt kids with hurt horses is brilliant. Although I thought I was opening a young reader’s book, this enabled me to connect to my inner child. Cracking into that shell is something hard for me, as it remains protected from all I have survived, but this book allowed me to go there gently. I found it very therapeutic and it really is a book for ALL ages. The younger character’s frustration with decisions being made around them and not with them was something I definitely am able to relate to. I have Native American roots and this story resonated deeply as the children connected with the spirit of the horse using meditation. I have a foal of my own named Noah and I used to visit him every other day or when it fit into my schedule, but since reading this book not a day has gone by without visiting him. An added bonus is that it has even prompted me into getting my own art supplies out, as the instructions woven throughout the horse art camp are inspiring. Thanks to the author for not only writing this but for helping me heal. Looking forward to the next Calico book! The main ideas of the story were solid: learning all about the wild horses out west and what’s becoming of them, how to help them, and also learning about quilting. I for one have always harbored a secret desire to learn to quilt, and this book inspired me to pursue this crafting avenue – and I was thrilled to learn of the organizations that will donate quilts to great causes! Calico horses and the Patchwork Trail by Lorraine Turner is an inspiring novel that deals with challenges affecting many children in America – divorce; moving away from loved ones; bullying; caring for each other; creating bonds between humans and animals and finding spirituality. It is the story of Carrie who is uprooted from New Jersey and moved across the country to Nevada after the divorce of her parents. As Carrie struggles with her new reality and new life during daytime; at night her dreams bring her mystery. Wild horses are coming to her in her dreams, leaving messages and clues for Carrie to decrypt. She shares this connection to the Calico horses with her new friend Milla and best friend Shannon. Soon the trio embarks on the mysterious trail of the calico swatches of fabric appearing everywhere and their link to the beautiful horses of the Calico Mountains that are rounded-up and taken away from their peaceful habitat in an a brutal effort to control their population. Through meditation and their strong spirituality, the girls sew the clues of calico fabric together into a quilt of life that leads them to overcome adversity and make a difference to the plight of the Calico horses. 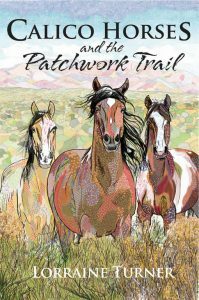 Calico Horses and the Patchwork Trail, delivers a strong social and environmental message to pre-teens. It brings awareness to the plight of American wild horses; teaching the reader how in the great web of life “we are one”; connected to each other; our slightest actions impacting each other. No matter how young we are, we can make a difference. In the world of books, “Calico Horses and the Patchwork Trail” makes a difference.